Vodafone’s Chief Executive, Yolanda Cuba was heading off to a meeting when she stopped to assist a customer into the Vodafone building. As it turned out, this man, Andrew Kufuor, a cousin of former President J. A. Kufuor, had come to personally thank a staff of Vodafone for saving his life. 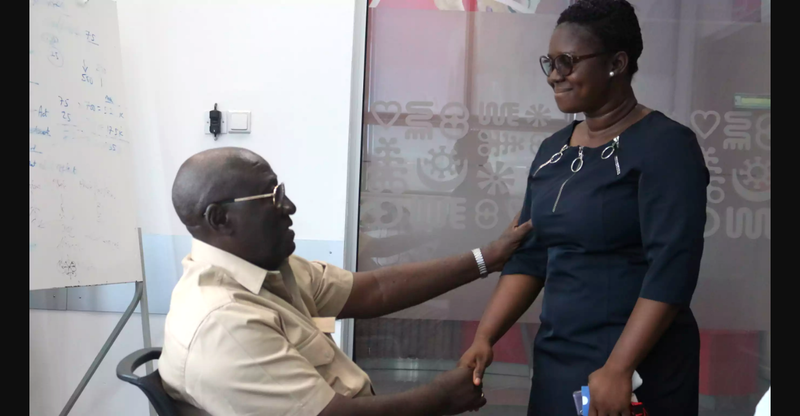 Eunice Ampomah-Manu, with the SME Enterprise team, had called Mr Kufuor sometime last week, on a routine customer check-up. Whilst on the call, Mr Kufuor suffered an attack. He was breathless and told Eunice, he was dying. She panicked but kept her composure. In a flurry of activity, including keeping Mr Kufuor on the line for about ten minutes, she managed to extract the digits of his wife’s number and called her. In a matter of minutes, Mr Kufuor’s wife rushed home and managed to get her husband to a nearby clinic to receive medical attention. Later in the week, Eunice also called to check up on him at the hospital. “I was helpless. Her call came in good time and I really want to thank her for what she did. She saved my life. Without that, I perhaps wouldn’t be here today,” he said. What started out as a cursory offer of assistance to a customer at the headquarters at Vodafone Ghana has become a very defining story of effective customer service.